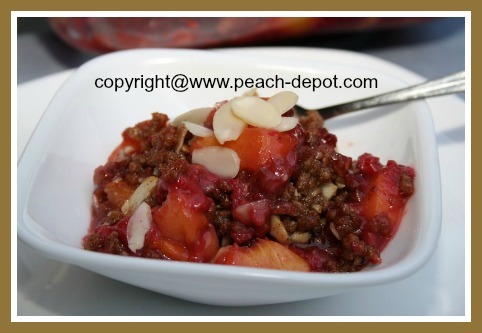 This Raspberry Peach Crisp Recipe (see the pictures!) has a topping made of all-bran cereal and sliced nuts. The perfect recipe idea for a dessert made with raspberries and peaches! 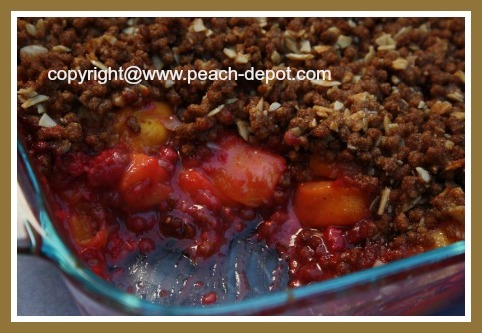 If you are looking for a peach crisp or crumble recipe without oatmeal in the topping, you have found a great one here! 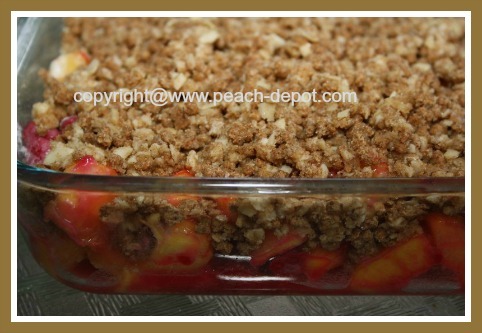 A Raspberry Peach Homemade Dessert Idea! Note - If you are using frozen fruit for this recipe, I would suggest you allow it to partially thaw before using it to make this crisp, discarding any excess liquid. Combine the sugar, honey, lemon juice and the flour in a large bowl. Add the prepared peaches and the raspberries and toss to coat the fruit. In another bowl, combine the bran cereal, sliced almonds, brown sugar and the cinnamon. Add the chilled butter pieces and using a pastry blender, mix until the mixture resembles coarse crumbs. 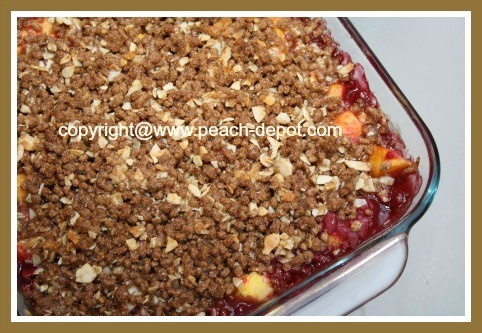 Sprinkle the crumb mixture over the fruit in the baking dish. Bake at 350° F for about 25 - 30 minutes, or until the fruit bubbles. Serve cold or warm: plain, or topped with a dollop of ice cream, whipped cream, whipped dessert topping or Greek Yogurt. GOT Raspberries? For over 400 Raspberry Recipes with Pictures, visit my other website, Raspberry-depot.com ! If you are peeling a lot of peaches at one time, consider dipping them in boiling water to make them much easier to peel.